Sugar is implemented on top of existing or modified operating systems and hardware. 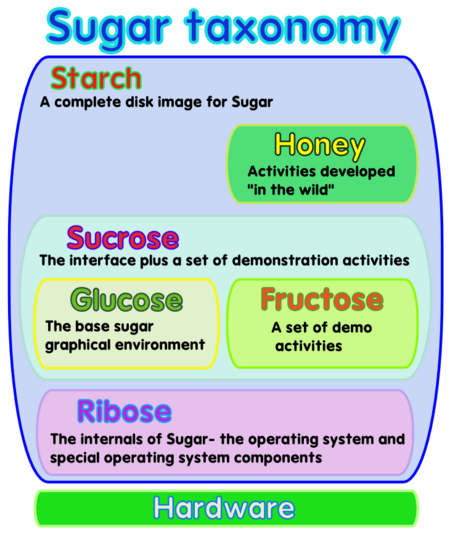 Sugar Activities ("Sugarized applications") are accessed by the user in the Sugar platform, integrated into a single Journal for storage, and are often designed with peer collaboration as a primary feature. Sugar Labs has borrowed names from carbohydrate chemistry, which includes sugar, to personalize and help distinguish pieces of Sugar software. See Taxonomy and On the Naming of Sugar for background. This page was last edited on 3 July 2012, at 14:21.